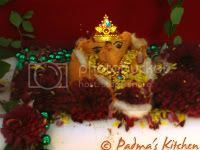 Ganesh Chaturthi was celebrated on 3rd Sep 2008 all over India and this year also we celebrated this festival with full devotion and joy in the company of our friends and family. Enjoyed all the tasty prasadams and naivedyam offered to Lord Ganesha. I already blogged my last year's celebrations, if interested have a look. But what is unique this year is I made Ganesh Idol out of all-purpose flour (maida) and decorated with the throne and ornaments brought from India. 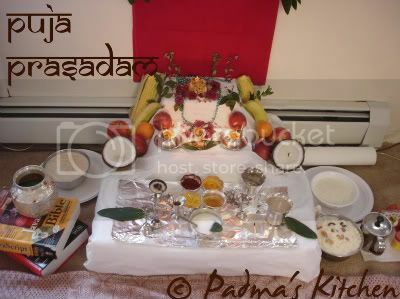 For this occasion I made Kudumullu, Uppu Undrallu, Semiya payasam, Chakkari Pongal, and Pala Thalikalu as prasadam/naivedyam (food offerings to God). I already blogged recipes for Kudumullu, Uppu Undrallu, Semiya Payasam and Chakkari Pongal/ Pramanannam. I am blogging only Pala Thalikalu here in this post. Pala thalikalu aka pammulu payasam is a milk pudding with rice dough strings shaped in small snake like shapes thence the name! This recipe is my newest attempt to make pala thalikalu and I successfully made them. But only thing is many strings got melted and only few left so I captured this picture for you to understand what I made. Not bad though, for first attempter! Boil water in a big, deep vessel/saucepan. Add ghee to it and stir in sifted rice flour. Stir in with a wooden spoon and see that there are no lumps formed. Once all the rice flour is mixed well with water switch off the gas. Cover and let it cook. Knead the dough while it is still hot, wet your hands with water and divide the dough into small 2 inch balls and later shape into long strings. Keep aside and let it dry for 10-15 minutes. Meanwhile boil four cups of milk, once it comes to a full boil add sugar, cardamom powder, saffron and let all the flavor blend well on medium heat for about 10 minutes. Add the prepared rice strings and let it boil for another 7-10 minutes. This tastes good hot or cold. The more thick you make rice dough strings the better. It will maintain its shape in the milk sauce/pudding, else it will end up being brittle, broken or melted. You can make the strings with chakli press but be careful that the strings might melt down in the milk sauce/pudding. Don't boil the milk pudding/sauce for more than 10 minutes. alamkaram chaala bhagundhi. ganapathi kireetam pettindha alage dorikinda. paala thaalikalu receipe choosanu try chesthanu. memu kudumulu chesthamu if u want i will send the receipe. The decoration is beautiful. Love the sweet never tasted before ! Swarna garu, Ganapati kireetam nenu Shiridi loni konnanu, ade pettanu. Sure ga mee kudumulu recipe kavali, pls send me soon. 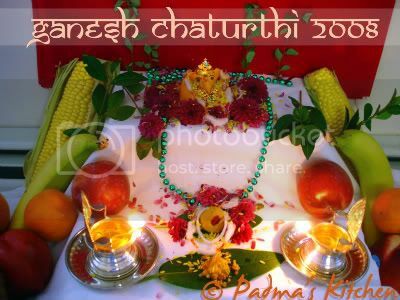 This blog is so nice...by seeing this blog i celebrated Varalakshimi Vratham this year..and even Ganesha chathurthi also ee blog ni chuse celebrate chesthunnanu. You have done excellent job.